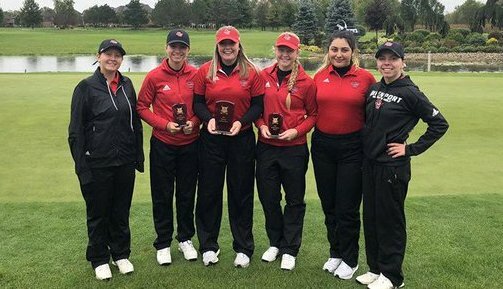 Rachael Rier from Hanover, Ontario, helped her Davenport University women’s golf team finish 1st in a small-field tournament in Indiana last week. Rier shot rounds of 93-80 and finished 7th in the Mike Laeleff Memorial Invite at White Hawk Country Club in Crown Point, Indiana. The host team was from Purdue University Northwest. The Davenport team finished with a 662 stroke total, while Olivet Nazarene University was 2nd with 679 and the Purdue team 3rd with 710. Leading the way for Davenport was Hannah Meloche from Windsor, Ontario who shot 83-73 and was 2nd. Fellow Panther Frida Henningsson shot 83-79 and was third. Finishing 6th was Panther Jessica Niemiec (90-81). The Panthers were 36 strokes better on the second day and head coach Melanie Loughin was thrilled with the turnaround. "I'm beyond proud of this team," she stated in a story on the school’s website. The Davenport Invitational will be held Monday and Tuesday (Oct. 15-16) at The Golf Club at Thornapple Pointe in Grand Rapids, Michigan.